Professor Jenny Stow is IMB’s Deputy Director (Research), where she is responsible for managing the scientific and competitive funding performance of the institute, as well as IMB’s postgraduate program. Professor Stow completed her undergraduate and postgraduate studies at Monash University in Melbourne, after which she undertook postdoctoral training at Yale University’s School of Medicine as a Fogarty International Fellow. She was soon appointed Assistant Professor in the renal unit at Massachusetts General Hospital, where she established an independent research group in cell biology. She returned to Australia in 1994 as a Wellcome Trust Senior International Fellow to join UQ’s Centre for Molecular and Cellular Biology (now IMB). 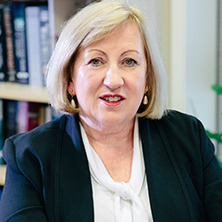 Professor Stow leads her own IMB laboratory within IMB's divison of cell biology and molecular medicine, and is a current National Health and Medical Research Council (NHMRC) Principal Research Fellow. How are cell adhesion proteins trafficked to and from different membranes in epithelial cells? Sorting and post-Golgi transport of E-cadherin We are using biochemical, genetic, proteomic and bioinformatic approaches to identify the sorting and vesicle-associated machinery involved in trafficking E-cadherin between the Golgi complex and the lateral cell surface. The dynamic assembly of the cadherin/catenin complex during trafficking is also being studied. Regulated recycling of surface E-cadherin � pathways, signaling and relevance to cancer. There appear to be different pathways and a variety of physiological regulators for the internalization and recycling of surface E-cadherin. The regulated endocytosis of E-cadherin is being assessed in both normal cells and in cancer cells. Carrier vesicles for E-cadherin transport. Imaging of fluorescently-tagged E-cadherin in live cells is used to track the intracellular transport of E-cadherin and to determine the roles of vesicle-associated proteins and other cargo proteins. How are cytokines secreted by macrophages? Functional genomics and proteomics of the secretory pathway in macrophages. Using a novel screening strategy and cell and molecular biology techniques we are characterizing the molecular machinery involved in cytokine secretion in macrophages. Novel roles for individual trafficking proteins are emerging from these studies. Carrier vesicles in cytokine secretion. Fluorescently-tagged proteins expressed in cells and in transgenic mice are being used for imaging and biochemical studies to characterize the secretory vesicles involved in TNF secretion. Trafficking and TNF in inflammatory disease. TNF is a potent proinflammatory cytokine and a major disease-causing entity in inflammatory bowel disease, rheumatoid arthritis and other chronic disease. Findings emerging from our studies on the trafficking of TNF are providing new leads and drug targets for anti-TNF therapies. The movement of proteins within cells – protein trafficking – is fundamental to life, with trafficking pathways and molecules central to many human diseases. Our research in molecular cell biology seeks to better understand the basic biology of trafficking in human cells, to pinpoint key factors contributing to disease and to devise new strategies for treating disease. Our work takes advantage of the cutting-edge facilities at IMB and of many valued collaborations with colleagues at the university, throughout Australia and around the world. Phenotype-genotype correlations in cystic kidney disease. Stow, J. L. and Teasdale, R. D. (2005). Expression and localization of proteins in mammalian cells. In P S E Little and J S E Quackenbush (Ed. ), Encyclopedia of Genetics, Genomics, Proteomics and Bioformatics (pp. ---) London, England: John Wiley & Sons. ICAT is a multipotent inhibitor of beta-catenin. Focus on "Role for ICAT in beta-catenin-dependent nuclear signaling and cadherin functions"
Localization of post -golgi trafficking of tumor necrosis factor-a in macrophages. Ikonen, E, deAlmeid, JB, Fath, KR, Burgess, DR, Ashman, K, Simons, K and Stow, JL (1997) Myosin II is associated with Golgi membranes: identification of p200 as nonmuscle myosin II on Golgi-derived vesicles. Journal of Cell Science, 110 2155-2164. Humphries, DE, Sullivan, BM, Aleixo, MD and Stow, JL (1997) Localization of human heparan glucosaminyl N-deacetylase/N-sulphotransferase to the trans-Golgi network. Biochemical Journal, 325 351-357. Gleeson, PA, Anderson, TJ, Stow, JL, Griffiths, G, Toh, BH and Matheson, F (1996) p230 is associated with vesicles budding from the trans-Golgi network. Journal of Cell Science, 109 2811-2821. Brand, SH, Holtzman, EJ, Scher, DA, Ausiello, DA and Stow, JL (1996) Role of myristoylation in membrane attachment and function of G alpha(1-3) on Golgi membranes. American Journal of Physiology-Cell Physiology, 270 5: C1362-C1369. Brand, Susan H., Holtzman, Eliezer J., Scher, Daniel A., Ausiello, Dennis A. and Stow, Jennifer L. (1996) Role of myristoylation in membrane attachment and function of Gαi-3 on Golgi membranes. American Journal of Physiology - Cell Physiology, 270 5 39-5: . Brown, D and Stow, JL (1996) Protein trafficking and polarity in kidney epithelium: From cell biology to physiology. Physiological Reviews, 76 1: 245-297. Brown, D and Stow, JL (1994) Moving Things Around - the Structural Basis of Intracellular Protein Trafficking - November 17-20, 1993 Chatham-Bars-Inn, Chatham, Ma. Journal of the American Society of Nephrology, 4 10: 1827-1831. Dealmeida, JB, Holtzman, EJ, Peters, P, Ercolani, L, Ausiello, DA and Stow, JL (1994) Targeting of Chimeric G-Alpha(I) Proteins to Specific Membrane Domains. Journal of Cell Science, 107 507-515. Dosanjh, A, Lencer, W, Brown, D, Ausiello, DA and Stow, JL (1994) Heterologous Expression of Delta-F508 Cftr Results in Decreased Sialylation of Membrane Glycoconjugates. American Journal of Physiology, 266 2: C360-C366. Dealmeida, JB, Doherty, J, Ausiello, DA and Stow, JL (1993) Binding of the Cytosolic P200 Protein to Golgi Membranes Is Regulated by Heterotrimeric G-Proteins. Journal of Cell Science, 106 1239-1248. Podolsky, Daniel K., Lynch-Devaney, Kathryn, Stow, Jennifer L., Oates, Philip, Murgue, Bernadette, DeBeaumont, Michelle, Sands, Bruce E. and Mahida, Yashwant R. (1993) Identification of human intestinal trefoil factor: goblet cell-specific expression of a peptide targeted for apical secretion (Vol 268, Pg 6694, 1993). Journal of Biological Chemistry, 268 16: 12230-12230. Podolsky, Daniel K., Lynch-Devaney, Kathryn, Stow, Jennifer L., Oates, Philip, Murgue, Bernadette, DeBeaumont, Michelle, Sands, Bruce E. and Mahida, Yashwant R. (1993) Identification of human intestinal trefoil factor: goblet cell-specific expression of a peptide targeted for apical secretion. Journal of Biological Chemistry, 268 9: 6694-6702. Nishikawa, K, Andres, G, Bhan, AK, McCluskey, RT, Collins, AB, Stow, JL and Stamenkovic, I (1993) Hyaluronate Is a Component of Crescents in Rat Autoimmune Glomerulonephritis. Laboratory Investigation, 68 2: 146-153. Stow, JL and Dealmeida, JB (1993) Distribution and Role of Heterotrimeric G-Proteins in the Secretory Pathway of Polarized Epithelial-Cells. Journal of Cell Science, 33-39. Ausiello, Dennis A., Stow, Jennifer L., Cantiello, Horacio F., De Almeida, J. Bruno and Benos, Dale J. (1992) Purified epithelial Na+ channel complex contains the pertussis toxin-sensitive Gαi-3 protein. Journal of Biological Chemistry, 267 7: 4759-4765. Cantiello, HF, Stow, JL, Prat, AG and Ausiello, DA (1991) Actin-Filaments Regulate Epithelial Na+ Channel Activity. American Journal of Physiology, 261 5: C882-C888. Stow, JL, Sabolic, I and Brown, D (1991) Heterogenous Localization of G-Protein Alpha-Subunits in Rat-Kidney. American Journal of Physiology, 261 5: F831-F840. Dealmeida, JB and Stow, JL (1991) Disruption of Microtubules Alters Polarity of Basement-Membrane Proteoglycan Secretion in Epithelial-Cells. American Journal of Physiology, 261 1: C691-C700. De Almeida, J. B. and Stow, J. L. (1991) Disruption of microtubules alters polarity of basement membrane proteoglycan secretion in epithelial cells. American Journal of Physiology - Cell Physiology, 260 4 29-4: . Holtzman, Eliezer J., Soper, Brian W., Stow, Jennifer L., Ausiello, Dennis A. and Ercolani, Louis (1991) Regulation of the G-protein αi-2 subunit gene in LLC-PK1 renal cells and isolation of porcine genomic clones encoding the gene promoter. Journal of Biological Chemistry, 266 3: 1763-1771. Stow, JL, Soroka, CJ, Mackay, K, Striker, L, Striker, G and Farquhar, MG (1989) Basement-Membrane Heparan-Sulfate Proteoglycan Is the Main Proteoglycan Synthesized by Glomerular Epithelial-Cells in Culture. American Journal of Pathology, 135 4: 637-646. Helme, R. D. and Stow, J. L. (1981) Immunological studies of brain-specific antigens. Clinical and experimental neurology, 17 211-222. Tumor-educated CD11c+/CD11bint/Gr-1-regulatory dendritic cells show a mutated pattern of trafficking molecules implicated in cytokine secretion. Stow, Jennifer Lea (2009). Control central - at the intersection of exocytic and endocytic pathways. In: Faseb Journal. , , (). .
Murray, Rachael Z. and Stow, Jennifer L. (2005). Cytokine secretion and phagosome formation are spatially linked in macrophages. In: Inflammation Research. , , (S93-S93). .
Manderson, Anthony P. and Stow, Jennifer L. (2005). Distinct intracellular transport pathways for the secretion of TNF and IL-6 in macrophages. In: Inflammation Research. , , (S94-S95). .
Stow, J, Bryant, D and Joseph, S (2004). Endocytosis of E-cadherin in polarized epithelia - Joint regulation of growth factor receptor internalisation and signaling. In: Faseb Journal. Experimental Biology 2004 Meeting, Washington Dc, (A711-A711). Apr 17-21, 2004. Joseph, SR, Miranda, KC and Stow, JL (2002). p120ctn binds to the cadherin/catenin complex only after delivery to the basolateral plasma membrane in MDCK cells. In: Molecular Biology of the Cell. 42nd Annual Meeting of the American-Society-for-Cell-Biology, San Francisco California, (72A-72A). Dec 14-18, 2002. Hayward, I. P., Bingley, J., Girjes, A. and Stow, J. (1999). Expression of heparan sulphate N-deacetylase/N-sulphotransferase in arteries and vascular smooth muscles in culture. In: Proceedings ComBio 1999. Combio99, Conrad Jupiters, Gold Coast, Qld., (Sym-27-04). 27-30 September. Wylie, F. G. and Stow, J. L. (1999). Membrane recruitment of RGS proteins by constitutively active Ga proteins. In: Combined Conference Abstracts: 43rd Annual ASBMB, 18th Annual ANZSCDB and 39th Annual ASPP. ComBio 99, Conrad Jupiters, Gold Coast, (Pos-Mon-10). 27-30 September, 1999. Heimann, K. R., Shurety, W. and Stow, J. L. (1999). Role of myosins in vesicle formation at the golgi complex. In: 24th Annual Lorne Conference on Protein Structure and Function. 24th Annual Lorne Conference on Protein Structure and Function, Erskine House, Lorne, Vic., (O-35). 7-11 Feb, 1999. Holtzman, EJ, Kolakowski, LF, Stow, JL, Brown, D and Ausiello, DA (1994). Functional-Characterization of Cndi Mutations in the Vasopressin V2 Receptor Using Epitope-Tagged Receptors. In: Journal of the American Society of Nephrology. , , (273-273). .
Stow, J. L. and De Almeida, J. B. (1993). Distribution and role of heterotrimeric G proteins in the secretory pathway of polarized epithelial cells. In: , , (33-39). .
Dignass, AU, Stow, JL and Podolsky, DK (1993). Transforming Growth-Factor-Beta-1 Modulation of Intestinal Epithelial Injury in An Invivo Model of Acute Epithelial-Cell Injury in Rat Small-Intestine. In: Gastroenterology. , , (A617-A617). .
Dealmeida, J. B., Doherty, J., Narula, N., Burke, B., Matlin, K. and Stow, J. L. (1992). Binding of the P200 Coat Protein to Golgi Membranes Is Regulated by Pertussis Toxin Sensitive G-Proteins. In: unknown, unknown, (A223-A223). unknown. Ausiello, D. A., Stow, J. L., Patenaude, C. R. and Cantiello, H. F. (1991). Guanine nucleotide binding proteins regulate epithelial Na+ channels. In: , , (333-346). .
Cantiello, HF, Stow, JL and Ausiello, DA (1991). Cortical Actin-Filaments Co-Localize with and Regulate Apical Epithelial Na+ Channels in A6 Cells. In: Faseb Journal. , , (A690-A690). .
Ausiello, DA, Stow, JL, Patenaude, CR and Cantiello, HF (1991). Guanine-Nucleotide Binding-Proteins Regulate Epithelial Na+ Channels. In: TSUI, LC, ROMEO, G, GREGER, R and GORINI, S, Identification of the Cf ( Cystic Fibrosis ) Gene. International Workshop On the Identification of the Cystic Fibrosis Gene : Recent Progress and New Research Strategies, Genoa Italy, (333-345). Apr 09-11, 1990. Stow, JL and Farquhar, MG (1989). The Core Protein of the Basement-Membrane Heparan-Sulfate Proteoglycan (Bmhspg) Is Secreted Basally From Mdck Cells Treated with B-D-Xyloside. In: Kidney International. , , (165-165). .
Caplan, MJ, Stow, JL, Newman, AP, Madri, JA, Anderson, HC, Farquhar, MG, Palade, GE and Jamieson, JD (1986). Sorting of newly synthesized secretory and lysosomal proteins in polarized mdck cells. In: Unknown, Unknown, (A8-A8). Unknown. Stow, JL, Glasgow, EF and Atkins, RC (1981). Ultrastructural Studies of Cultured Glomeruli. In: Journal of Anatomy. , , (305-306). . Establishment of the Australian Cancer Foundation Laboratory for the study of the molecular biology of cellular differentiation.